Looks quite good for the money - selling for £40+ on EBay | £35 on amazon prime. In store from Sunday 17th or available to pre order today. Never forget where your screwdriver is again with this handy Keter Cantilever Trio. Perfect for organising while the table cantilever mechanism will keep all your content spread in front of you while working. Looks a little bit like it will definitely fall over.. They definitely don't fall over. 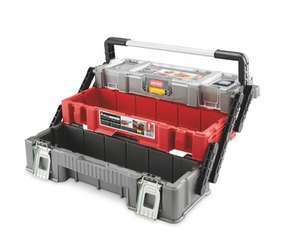 Great little toolbox!